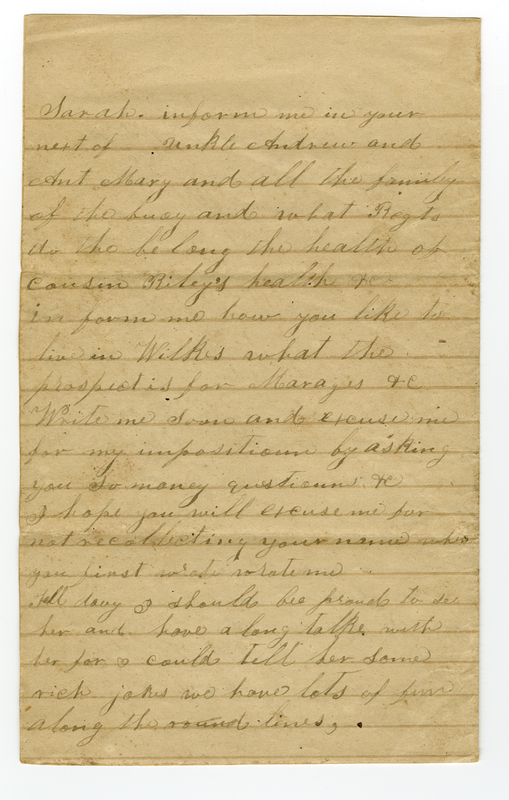 Item Description: Letter, 1 September 1864, from Alfred N. Proffit, private in Company D, 18th Regiment N.C. Troops to his sister and cousin. 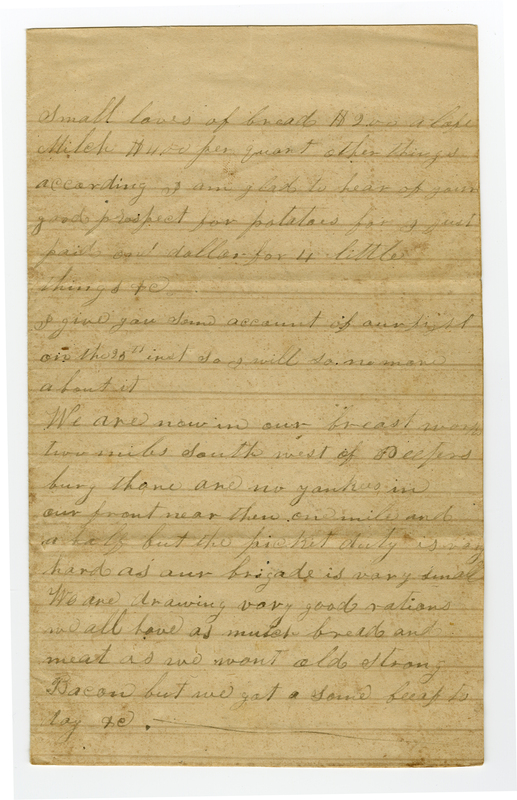 Item Citation: From folder 4 in the Proffit Family Papers, Southern Historical Collection, Wilson Library, University of North Carolina at Chapel Hill. Esteemeed sister and cousin yours of the 22nd is at hand and it did not fail to interest me vary mutch to learn that you war all well. 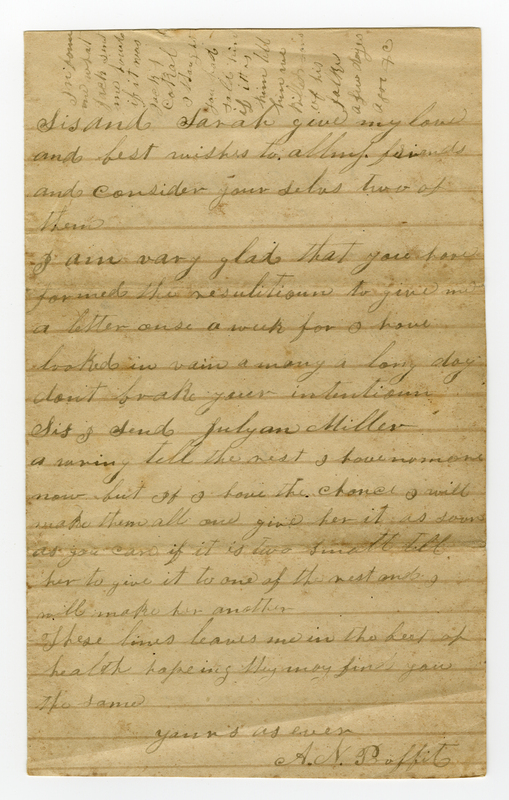 I am glad to hear from those fine revivals in Wilkes & also your fine crops – wheat, turnips, corn etc. I should love to be thare to help you eat some vegitables as they are so dear here. I can hardly buy them. I will give you the prices of a few artickels: Appls from 2 to 5 dollars per dozen. Peaches and the same for onions $3 per quart. Water mellons from 3 to 10 dollars a peace. Butter $15 per labs. Small loves of bread $2 a cake. Milck $4 per quart and other things according. I am glad to hear of your good prospect for potatoes for I just paid one dollar for four little things. I give you some account of our fight on the 20th inst so I will no more about it. We are now in our breast works two miles south west of Petersburg. Thare are no yankees in our front nearer than one mile and a half but the picket duty is hard as our brigade is vary small. We are drawing vary good rations. We all have as mutch bread and meat as we want. Old strong bacon but we got some beef today. Sarah inform me in your next of Unkle Andrew and Ant Mary and all the family of the brig and what Regts do thay belong, the health of cousin Piley’s health etc. In form me how you like to live in Wilkes & what the prospect for Marages is. Write me soon and excuse me for my imposition by asking so many questions. I hope you will excuse me for not recollecting your name when you first wrote to me. Tell davy I should be proud to see her for I could tell her some rich jokes. We have lots of fun along the lines. Sis and Sarah give my love and best wishes to all of my friends and consider your selves two of them. I am vary glad that you formed the resolution to give me a letter onse a week for I have looked in vain many a long day. Dont break your intention. Sis I send Julyan Miller a [illegible]. Tell the rest I have run out but if I have the chance I would make them all one. Give her it as soon as you can if ti is two small tell her to give it to one of the rest and I will make her another. These lines leaves me in the best of health hopeing that may find you same. 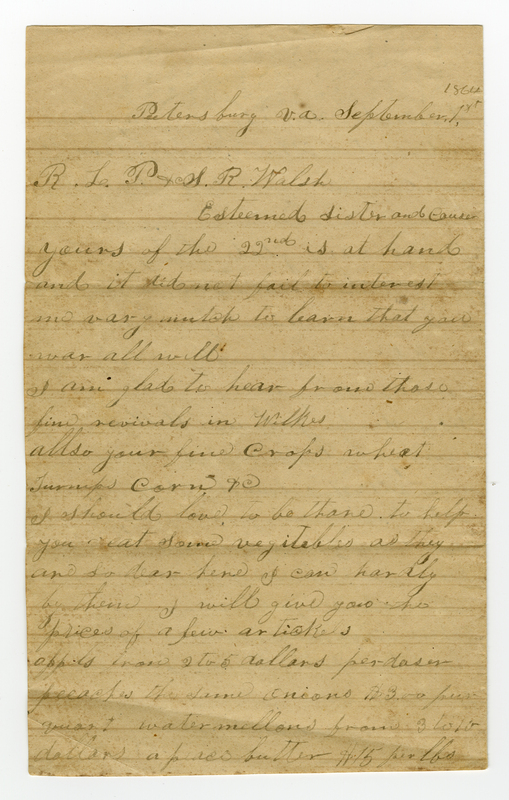 This entry was posted in Southern Historical Collection and tagged 18th Regiment North Carolina Troops, Alfred N. Proffit, food, North Carolina, Petersburg, Proffit family, Wilkes County. Bookmark the permalink.